By GreenEyedLillies on April 10th, 2009 . Filed under: Cupcake Ideas . It’s the sweetest clock you’ll ever see! Old-fashioned design is accented with delicious confections and boasts, “World’s Best Cupcakes.” Crafted of wood composite with large numerals. Quartz movement. Requires one AA battery. Keyhole hanger. 13 1/2″ diam. Thanks to ATC Reader Julie for bringing this to our attention. Ive been meaning to read this and just never acquired a chance. Its an issue that Im extremely interested in, I just started reading and Im glad I did. Youre a great blogger, 1 of the finest that Ive seen. This blog surely has some data on topic that I just wasnt aware of. Thanks for bringing this things to light. 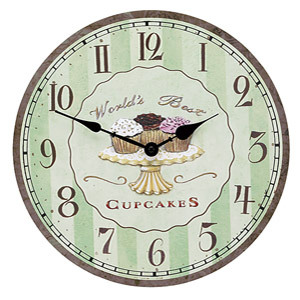 World's Best Cupcakes Clock – All Things Cupcake – just great!